Shea butter – citrus is GMO free and has received the cruelty free PETA seal of approval. It is perfect for skin that is itchy, dry, irritated, sensitive, flaky and/or cracked. It is non-greasy and chalked full of vitamins, nourishing your skin and making it look silky and smooth. Shea butter – citrus effectively soothes, heals and repairs skin that is itchy, dry, irritated, sensitive, flaky and/or cracked. It is non-greasy and contains many vitamins, nourishing your skin and making it look silky smooth. It may also relieve symptoms of eczema, psoriasis, atopic and seborrheic dermatitis. Shea butter is suitable for both men and women and makes a perfect gift. After showering, massage into the skin until fully absorbed. The shea butter is concentrated and a small amount has long lasting effects. Aya Natural believes that products which are not edible, should not be applied to the skin. 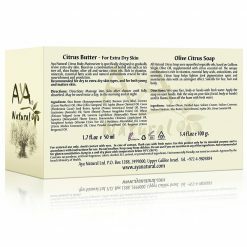 Therefore, products are made from natural ingredients in which extra virgin olive oil, of an edible grade, is the main ingredient. These products are based on ancient medications and cosmetics recipes passed down generations that can be traced back hundreds of years. Combined with modern academic studies and scientific research, to produce high quality premium products made from purely plant based ingredients. 100% natural, paraben free herbal blend of shea butter, cocoa seed butter, coconut oil, olive oil, jojoba oil, beeswax, apricot kernel oil, avocado oil, sweet almond oil, wheat germ oil, honeysuckle flower extracts, vitamin E, tea tree oil, lemon oil, grapefruit oil, bergamot oil and jojoba seed oil. 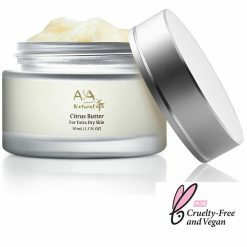 Shea butter – citrus has received the cruelty free PETA seal of approval and is free of any GMO.